DETROIT (Detroit Free Press) – A 9-year-old boy leaped or fell to his death from a bedroom of his family's ninth-floor apartment unit Wednesday, Detroit police said. After the fall, no paramedics arrived on the scene and the boy was transported to the hospital in a police car. A state lawmaker is blaming city budget cuts for the lack of EMS response. According to police, the youth had threatened to commit suicide several times recently. The incident occurred about 5:30 p.m. at a low-income housing complex, about one-half mile west of Henry Ford Hospital. "It's real sad. There's too many young people doing this," said bystander Sheila Bowman, 35. Wednesday's apparent suicide comes less than two months after the May 23 death, later ruled a suicide by the Wayne County Medical Examiner, of a 7-year-old Detroit boy. He was found hanging by a belt from his bunk bed after he locked his bedroom door, following weeks of complaining about being bullied at school, according to a police report. At the time of the May suicide, psychologists at Children's Hospital of Michigan in Detroit and at the University of Michigan in Ann Arbor said children's threats of suicide should be taken seriously. Experts said that children considering suicide do not show the usual signs of depression but instead may act irritable or angry. Outside the brick high-rise where the boy died Wednesday, Michele McCray said she was sitting in the shade when "I heard a thump and then someone moaning." McCray, 56, said she turned and saw the boy's crumpled body a few yards away, on the grass next to the building. "I really didn't feel I should go over there," she said. Instead, McCray ran into the apartment building's lobby and shouted for anyone with a phone to call 911, she said. "He was a good kid — he was a skateboarder," said Faith Tucker, 35, who lives on the second floor of the 10-story apartment tower. Because no EMS truck arrived at the scene, the boy was taken to the hospital in a police squad car, bystanders said. State Rep. Rashida Tlaib, D-Detroit, confirmed that Wednesday night. "It's just unbelievable," Tlaib said. "Can you imagine the family of that child — not seeing any ambulance come?" 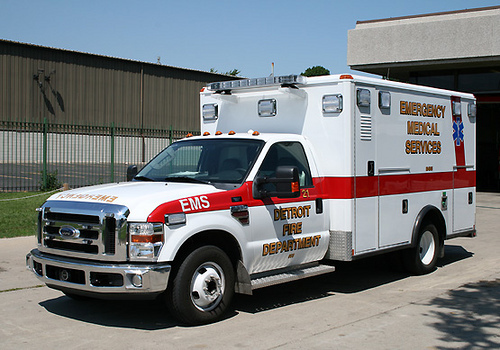 She blamed city budget cuts for what she said was an unprecedented shortage of EMS trucks in Detroit. On July 7, a father whose 14-year-old son was fatally shot in southwest Detroit had to drive his son to the hospital because no EMS truck was available, Tlaib said. She notified state officials Wednesday of both incidents and requested an investigation. Both incidents occurred in Tlaib's 12th state House District, which covers the south end of Detroit and once was patrolled by five EMS trucks. "As of today (Wednesday), we have none. They have to dispatch one from the east side now," she said. "The state needs to request a full investigation of this" through the agency that licenses ambulances in Michigan — the Crime Victims, EMS and Trauma Systems Division of the Michigan Department of Community Health, she said. What an awful story! Just speechless. Stuff like this should not happen; our babies should not be wanting to die and for no response from EMS. This just should not be!